Last night, the offspring of France’s greatest contribution to pop music brought out an expat French community and fellow Francophiles in droves. 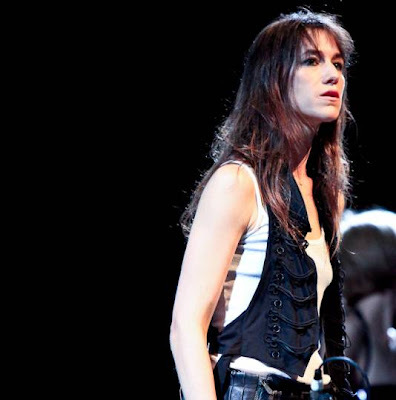 Charlotte Gainsbourg, the daughter of Serge and a well-respected actress, is on her debut tour for IRM. It’s her third studio album–produced, and largely penned, by Beck–but for many Americans, the record has served as an introduction to her music. At last night’s intimate Palace of Fire Arts affair, Gainsbourg stepped out of the musical shadow of her father, showing fans she’s a talented singer in her own right. 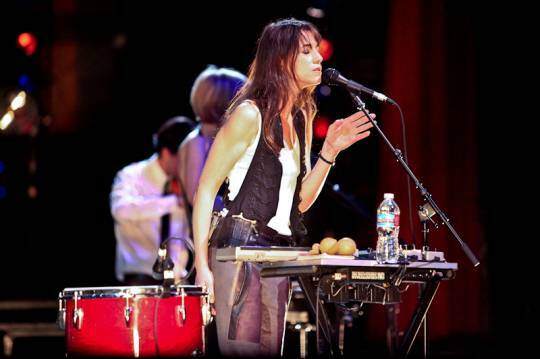 Opening for Gainsbourg was Jogger, a two-piece electronic act that played haunting, genre-bending mixes. The group was entertaining, although the lack of lighting effects that usually accompanies live dance music took away from the show. The other opening act was AM, fresh off the Air tour. Usually a sextet, the band paired down its setup for the road, playing layered pop tunes on homemade instruments to a half-filled theatre. When it was time for the headliner, Gainsbourg arrived quietly onstage, looking very thin in person. She stood motionless for a bit, skittish as a scared kitten. With her hands in her pockets and head down, it was clear she has yet to acquire a confident stage presence. The small size of the theatre made her seem even more vulnerable. She got off to a halting start, nervously fumbling over lyrics and referring to a notebook to remember some of the words to her songs. 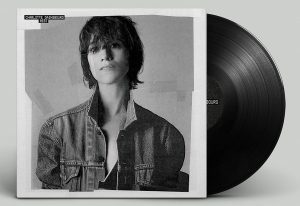 Like Gainsbourg’s last album, 5:55, IRM is a pretty mellow affair. The singer’s live group added depth to the material, though. A five-piece band with synthesizer, guitars, percussion, and strings took poppy, radio-friendly singles like « Heaven Can Wait » and « Trick Pony » and surpassed the studio versions in ways that would have made Beck proud. It was unfortunate the Palace of Fine Arts is all seated, because by the way the chairs were rocking back and forth, people wanted to move. Other highlights from the performance included the Jarvis Cocker-written « Jamais, » Dylan’s « Like a Woman, » and Serge Gainsbourg’s « L’Hotel Particulier » from Histoire de Melody Nelson (arguably the elder Gainsbourg’s best album). Interestingly enough, Gainsbourg looked more comfortable singing her father’s songs than her own. But once she’d channeled him, she also finally seemed relaxed onstage. After a three-song encore, Gainsbourg left to a standing ovation. She proved that despite her shyness, musical talent is indeed hereditary in her family. Celeb sightings: Peter Coyote was in the crowd, as was David Crosby’s doppleganger–who had more people buzzing than Coyote. When coming to the Palace of Fine Arts in San Francisco for the first time, one suspects the giant pavilion/gazebo that sticks out as far away as Russian Hill on the eastern side of the city is the actual venue. The size of the structure alone suggests an outdoor amphitheatre seating a large number of people. It would certainly create a magical element in certain scenarios, especially in the case of chanson heir Charlotte Gainsbourg’s first tour. Alas, the place is simply an indoor theatre, which is a bit of a letdown, despite its impressive acoustics and rocking-chair seats. Opener AM is surprisingly prolific in touring with big names: He had only appeared a few weeks prior in Oakland opening for AIR, and recently opened for Caetano Veloso in LA. His music could fit with either: After ekeing out the first few numbers flatly, he pulled out an eerie, bossa nova-esque number that was mellow enough to set a consistent and solid mood for the rest of the set. He was a small man on a big stage, but once he settled, he reached out to the audience well. The lone exception was closer “Self-Preservation,” a break from the mood that sounded more like Interpol than Jorge Ben. If he just sticks with the mellow, he’ll be going places. Supporting act Jogger, on the other hand, threw consistency out the window and beat it with a shovel once it got out of the building via hot-air balloon. The duo, from L.A., tend to take a sample and just run with it, whether from Madonna or Generic Williamsburg-based Band #862. Sometimes they ran into brick walls like the Juggernaut in a tutu, going from dirges to electronica without paying attention. Incredibly, they even combined those two: “Nephicide” is the first time I’ve heard a band effectively combine bowels-of-your-lungs, black-metal vocals with techno. Even their on-stage antics were silly: Jonathan did everything in his power to rock out while behind his synths and samplers, while Amir veered between shoegazing guitar and singing into his violin. Make of that what you will. 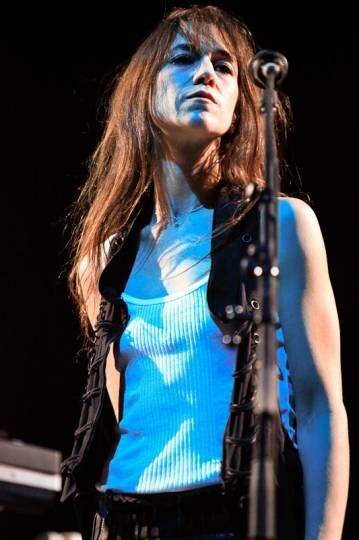 Charlotte Gainsbourg is clearly on her first tour. In particular, her singing in “Greenwich Mean Time,” from the recent album IRM, was completely off-key, making one wonder if it was intentional. But after that, she managed to sing much better, (barring a false start on one song) playing around with the crowd’s momentum. 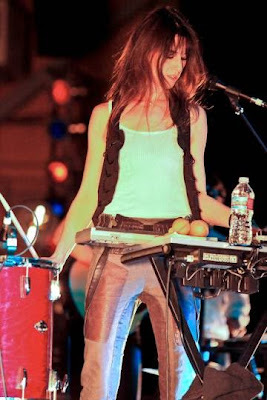 She even channeled collaborator Jarvis Cocker in 5:55 number “AF607105,” though she sounded more like Neil Tennant. Most significant, though, was that she got comfortable to not only sing her Bob Dylan cover “Just Like A Woman” in a sultry manner, but channel her legendary father with his classic “L’hotel particuler,” from Histoire de Melody Nelson. She will definitely need more time to figure out her comfort zone live, but she can still captivate, and should make touring a habit.